The revealer tells you everything you need to know about the theme in this 16×15 puzzle: 39a. [Beatles hit that’s a hint to both parts of the answer to each starred clue], ALL YOU NEED IS LOVE. 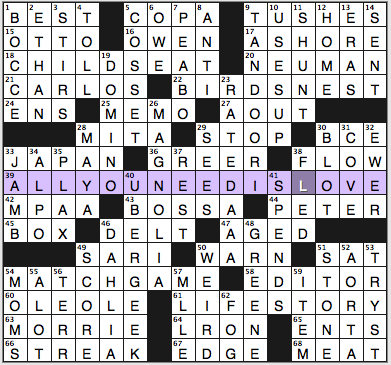 All the words in the other theme answers can follow “love” in a familiar term. 18a. [*Removable car safety feature], CHILD SEAT. Love child, loveseat, nice. 22a. [*Asian soup ingredient], BIRD’S NEST. Lovebirds, love nest, also good. I’m thinking avid birdwatcher Gareth didn’t write this clue. 54a. [*Classic daytime show hosted by Gene Rayburn], MATCH GAME. I loved Match Game in the ’70s. An essential part of the ’70s kid’s education in adult language. Love match, a love game in tennis. 61a. [*Biography], LIFE STORY. Love life, love story, lotsa romance. Solid theme. Gareth supplements it with fill like TANDOORI and MAGNOLIA (and DAHLIA, because one flower is never enough), a couple open corners, and good flow throughout the grid. On the down side for many solvers, there are a lot of names in the puzzle (15+), which didn’t slow me down but can be a solver’s undoing. 1a. [First word in every Academy Award category], BEST. Really an excellent clue. Easy but fresh. 49a. [Dhaka dress], SARI. My friend from Bangladesh spells it “saree.” Not sure if that’s the norm in Dhaka’s country or not—but the norm here (or at least in our crosswords) is SARI, and the attire is the same regardless of the spelling. 28a. [Classic name in photocopiers], MITA. Does “classic” mean “defunct” here? Yep, the brand was folded into Kyocera. Potentially tough crossing with 28d: [Architect Lin], MAYA. Could also be crosswordese old actress NITA Naldi crossing NAYA Rivera, but that’s just cruel. Surprised the MAYA clue isn’t the American civilization. 1d. [Lawn sport], BOCCE. When I was a teen, we had neighbors who played BOCCE. I couldn’t tell you whether they spelled it bocce, bocci, or boccie (all are in the dictionary). 1A [Baymax’s friend in a Disney movie] HIRO – I actually saw “Big Hero 6” and I don’t remember this character’s name. GREAT movie, though. 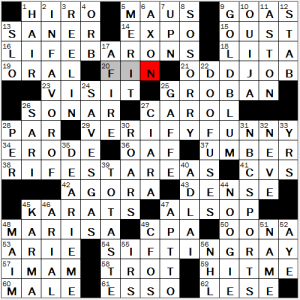 21A [Irregular way to get paid] ODD JOB – Not crazy about this clue, maybe because it stumped me. I had ON SPEC in there at first. Is the bad guy from “Dr. No” a better way to clue this? Or just an easier way? 2D [Pro] IN FAVOR OF – Very nice entry. 9D [“Jurassic Park” actor] GOLDBLUM – Since “Jurassic World” is coming out, and I’ve seen the trailer for it like 25 times, I was thinking of the wrong movie. He’s actually in the first two of this franchise. Maybe I didn’t think of him because I loathed the second one so much…. 24D [Demonstrates fuel efficiency] SAVES GAS – Another nice, different entry. 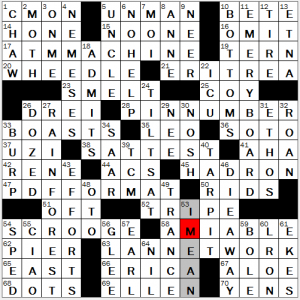 31D [Airer of the Triple Crown and the Summer Olympics] NBC SPORTS – Seems like both have been on NBC for decades, so this puzzle will still be relevant for the 2040 Olympics! Solid 3.5 stars from me. 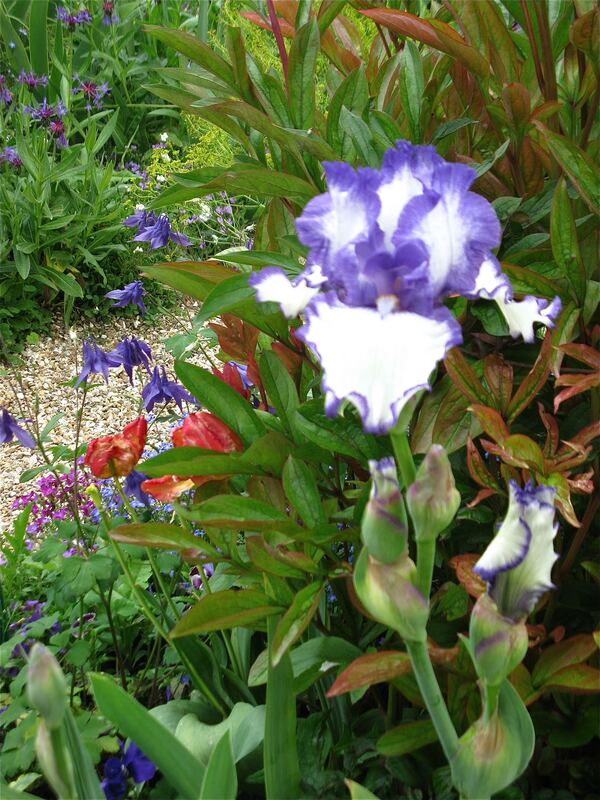 “NO RUSH,” but tell me, how does your garden grow? I sure ADORE the variety of this one—and that the not-so-easy or often-seen PHYTO- [Plant: Prefix] has the benefit of being tied into the theme, since a flower is the reproductive part of a plant. AIRBORNE feels like another tangentially related bit o’ fill, as pollen season is definitely upon us in these parts and, oh, if only that annoying stuff really were [Gone with the wind?] and not simply DISPERSEd by it! So, no conventionally laid-out themers today, but—in addition to the fill and clues mentioned above—let me cite some other highlights. Lookin’ at you, HAZARDED; ESCORTED [Accompanied to the prom] (and maybe presented with an orchid…); “DEAR SIRS:…”; RINGLET; STRIATED [Like some Italian marble] (is striated marble uniquely Italian? I’m thinkin’ mebbe not); ONE IRON [Golfer’s “butter knife”] (seen here); ZEALOT; GO APE, clued in the non-Elmer’s sense of [Come unglued]. Oh–and I also like the non-casual-clothes-related sense of [Dressed down a bit] cluing CHIDED. And how about that Thomas EDISON, huh? When proposing to his much younger (second) wife, does he WOO [Lavish…] her […with flowers and chocolate]? Apparently not. Instead [He proposed to his wife in Morse code]. Okay, maybe there were flowers and chocolate when he first came a-courtin’, but would proposing by Morse code be the 19th century equivalent of proposing by texting? Of course, the story is he tapped out the code on her arm, so at least they were in the same room! Clue that made me think twice: [Apple application, once]. Felt certain this was going to refer to some outmoded Apple program (like MobileMe), but no, this really is referring to the now-banned chemical ALAR. 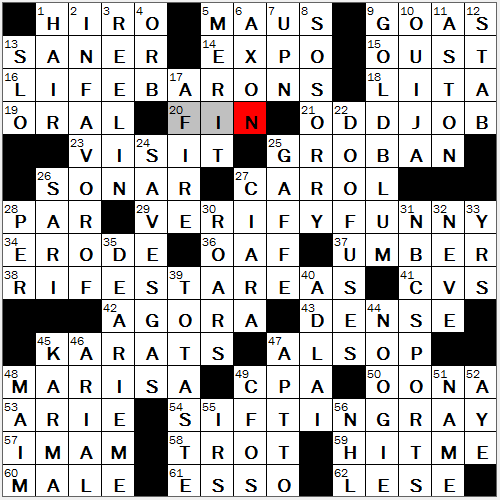 Good day, crossword fans! My apologies for the last couple of days, as I was wrapped up in college lacrosse championship duty in Philadelphia. But hope things have been going well for you in the past few days, and hope you enjoyed today’s puzzle, brought to us by Ms. Patti Varol. 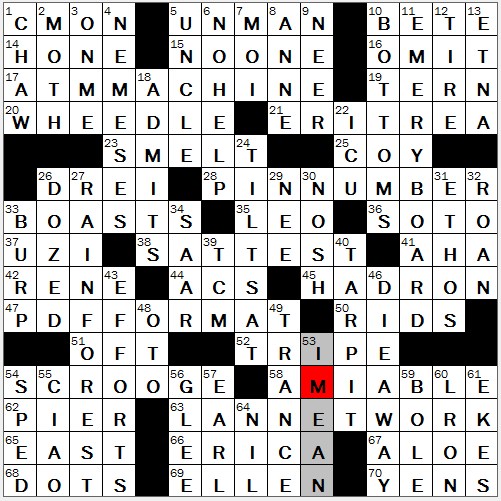 In it, four theme answers are puns in which the letter “Y” is removed from common phrases/nouns. BATTER POWERED (26A: [Running on cake mix?]) – How many other people taste/lick cake batter from the bowl once you place the batter onto the pan? I know I habitually do that. COMMUNIST PART (45A: [Villanous role in a Cold War thriller?]) – If a communist was doing this puzzle, he/she might say, “DEMOCRATIC PART” doesn’t fit! One former CrosSynergy blogger, Sam Donaldson, told me that he would regularly abstain from looking at the puzzle constructor’s name while solving the grid and take a guess at who constructed the grid. So, for every time I see METS in a grid, I’m definitely going to assume that our resident Mets fan, Ms. Varol, might be a prime suspect (13D: [Team with a skyline in its logo]). 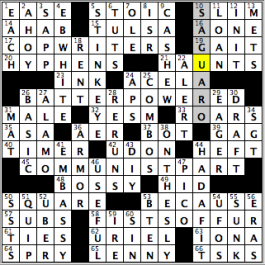 Initially didn’t get GAIT as I was thinking of a direction (east/west), and it didn’t help that I got the second and fourth letters, which made me put down ‘east’ to start out (19A: [Way to go?]). I do own rectangular Post-its to go along with my SQUARE counterparts (50A: [Shape of many Post-its]). I see YESM and I think that’s what James Bond would say to the head of MI-6 before going on an assignment, killing the bad guy(s) and getting the girl at the end (32A: [Polite backwoods agreement]). “Sports will make you smarter” moment of the day: SAPP (3D: [NFLer Warren who competed on “Dancing with the Stars”]) – The good about Warren SAPP: He was a seven-time Pro Bowler while playing for the Tampa Bay Buccaneers, who recorded the second-most sacks in NHL history for an interior lineman (96.5). He won the Super Bowl with the Buccaneers in the 2002 season, and, after his career, became an analyst on the NFL Network. The bad about Warren Sapp: he’s had run-ins with law on multiple occasions during Super Bowl week, including being arrested on suspicion of soliciting a prostitute and assault this past February. He’s currently working on getting those charges dropped as part of his plea deal, though his contract with the NFL Network was terminated. Thank you for your time once again! I promise I’ll see you all tomorrow! Again, nicely done. Didn’t realize there were this many. Can anyone think of any others? It would seem like there are more. Nothing unfamiliar here, which made the solving fairly smooth. 15A [Herman’s Hermits frontman Peter] NOONE – A better than clue than having to clue the phrase NO ONE, which ironically is also usually musically related. 45A [Large ___ Collider: particle accelerator] HADRON – Not necessarily in the learn-something-new-every-day category, but a little deeper in the well to pull out. Something different. I enjoyed it. 11D [Manicurist’s buffer] EMERY BOARD – One of two long down entries that are actually longer than one of the theme entries. Not a problem at all, since all theme entries are across and both of the long downs are nice entries. 27D [Amazonian ecosystem] RAIN FOREST – The second nice long down entry. 60D and 61D [Dianetics creator ___ Hubbard] L RON; [Endures hardship to make, with “out”] EKES – We get all the way to the end of the puzzle to find trite entries. EKES is used liberally, but the K is needed for a long entry, and it’s not as bad as crosswordese using only vowels and Wheel of Fortune bonus round freebies. There is actually an interesting documentary about Scientology on HBO, so I learned a lot more about the famous L. Ron Hubbard. Did you know the L is for Lafayette? Interesting documentary if you want to gain insight on him. This entry was posted in Daily Puzzles and tagged Elizabeth C. Gorski, Gareth Bain, Matt Jones, Patti Varol. Bookmark the permalink. NYT: what a great theme to end the long weekend and kick off the summer season.. Fun, romantic, upbeat. I usually look at the constructor’s name but totally missed that it was Gareths’s until I read Amy’s review. It’s weird how many things in this puzzle mean something a little extra to me… For example, my daughter got married in Sonoma last fall and for the dinner the night before the wedding, she found a place where you can eat Italian and play BOCCE ball (a prequel to the Champagne Pong played during the wedding reception… ). She married an UBERGEEK. Also in the puzzle: DOMINOS— the founder lived in our neighborhood and 30 years ago when we first moved to the area, his teenage daughter had a little business delivering the Sunday NY Times along with fresh croissants! Enterprising family! But beyond all that, I just thought it was beautifully done. LA Times: I enjoyed this puzzle with its BURP, CHAW, NEMESES, and others and its lack of tortured clues and tortured answers. 42A [Tennis great Lacoste] (RENE) (b. 1904, d. 1996) won seven Grand Slam singles titles in France, Britain, and the U.S. He introduced Chemise Lacoste shirts (another redundancy, it fits with the puzzle! ), sometimes called “alligator shirts.” Actually, the emblem is of a crocodile, which was Lacoste’s nickname. An obituary of his son Bernard describes how Lacoste got the nickname: he bet his team captain that he would win a crucial match; the payoff was a crocodile-skin suitcase in a Boston store. A friend then added a crocodile embroidery onto a blazer that Mr. Lacoste wore while at the tennis courts. He designed and created a tennis ball pitching machine to help him practice, and after he retired, he patented and introduced the first tubular steel tennis racket in 1961; the Wilson T-2000 version of that racket was used by Jimmy Conners and Chris Evert. Nice puzzle — so nice, in fact, that I can only come up with one quibble (because that’s what I like to do…) I wouldn’t describe BOCCE as a ‘lawn sport’ — it’s generally played on a hard or sandy surface (see the pictures at the wikipedia entry). Bocce is a cousin to lawn bowls, which you will be surprised to hear is played on a grassy surface. 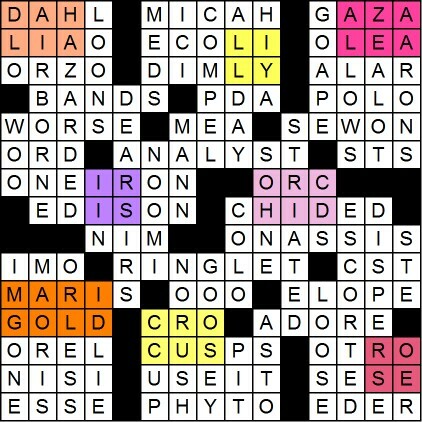 I notice that the top line of the puzzle reads BEST COPA TUSHES — are those awards that are handed out every year at the Rio Carnival? nice double feature from gareth! in the LAT, was TAR PIT a deliberate easter egg? LA residents will know this mostly from the la brea tar pits, a name that translates (delightfully) as “the the tar tar pits”. A double dip of Gareth- what better redundancy can life give you!!!!!! Don’t dis Derek. He wrote his LAT piece when it was too early to be posted, and I forgot to paste it in. And don’t dis me as the person who was blogging the Tuesday and Saturday LATs before Derek. I was not dissing Derek or you. I enjoy getting your perspective on the LAT and other opinions and with what I thought was an obvious tongue in cheek with the ‘wah wah’ was as I often do, trying to get some discussion of the LAT going. In this case, with Gareth have a daily double, and his theme having been used before, I was really surprised there were so few comments. great double-header day for gareth — smartly done all around! and to respond to derek, an example that springs to mind is UPC CODE. which may have once occupied the real estate where we find SAT TEST…..